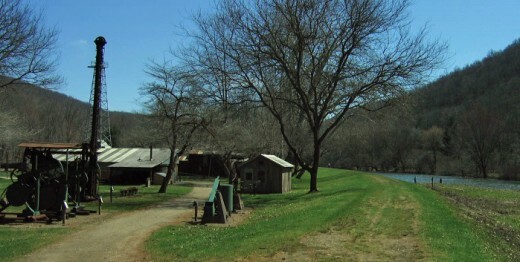 Site of first American commercial oil well along Oil Creek in Titusville, Pennsylvania. I walked along Oil Creek in Titusville, Pennsylvania, on a sunny afternoon. But if you could find a time machine and go back 150 years, 4 months, and 22 days (that is, to August 27, 1859), you'd be with Colonel Edwin L. Drake as he struck oil right here for the first commercially drilled oil well in the United States. 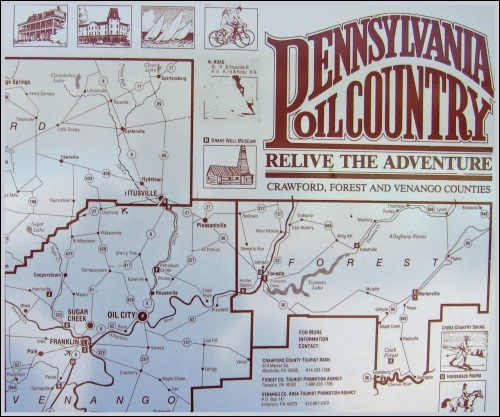 This year, this part of northwestern Pennsylvania, which promotes itself as "Oil Heritage Country," is celebrating this groundbreaking event which marked the birth of America's petroleum industry. 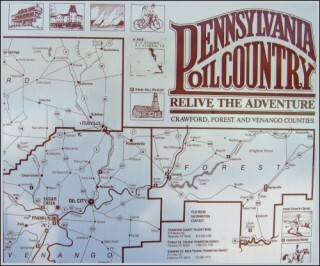 Visiting this part of northwestern Pennsylvania offers fascinating glimpses into the past. But you often have to use your imagination. In Titusville, once a city flowing with oil money, you can still see some of the stately old homes. 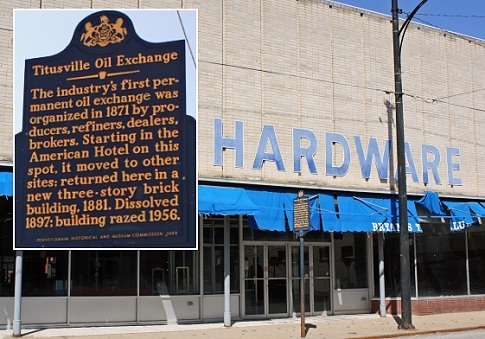 But many key oil-related sites in the downtown are just remembered with historical markers. Historical marker in downtown Titusville, Pennsylvania. Not far from Titusville, you'll find the site of perhaps the most remarkable of America's "boom towns." 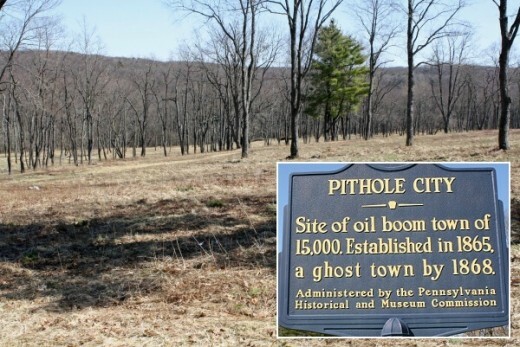 Pithole City, was born on January 7, 1865, when oil was struck along Pit Hole Creek. Just nine months later, Pithole had exploded to a population of 15,000. 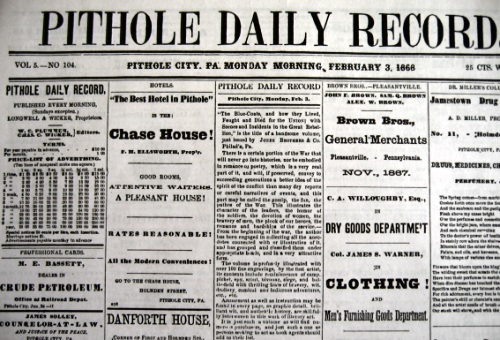 Pithole boasted 16 hotels, a daily newspaper, an opera house, two banks, and many oil related businesses. But by 1867, its economy -- and population -- were collapsing, as the local oil field went dry. While the rest of the region continued to export crude oil (production peaked in 1891), Pithole had long since vanished back into the woods and creeks (see photo below). Nature has taken over where Pithole City once boomed. But let's end on a more contemporary note. Interestingly enough, the very same region which created America's oil industry is now leading the way in developing one potential alternative to the use of oil -- geothermal energy. 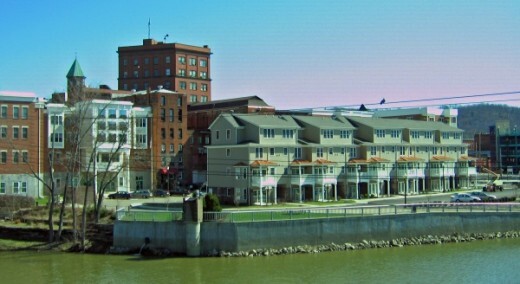 Perhaps furthest along is the city of Warren, Pennsylvania (see photo below). With a population of just over 10,000, Warren is located along the Allegheny River, about 30 miles northeast of Titusville. Warren was another oil hub in the late 19th and early 20th century. "Low-temperature geothermal -- or aqua-thermal-- provides a steady, and predictable cost of energy over long periods of time. ... Warren joined with developers Impact PA and Geothermal Energy Systems Inc. for a project called Impact Warren. ... Impact Warren broke ground with an eco-friendly parking garage. Then, in a move that makes Warren’s system distinct, they installed a central geothermal line that can serve multiple buildings with multiple building owners, offering each of them the opportunity to cut utility costs and reduce greenhouse gas emissions. To date, high-end waterfront condominiums, a new transit building, and two mixed-use buildings with commercial space and apartments—several serving elderly residents on a fixed income -- are connected to the central line." As Rogers goes on to note, "The whole basis of the Impact Warren program is to establish an environment with low cost energy that will attract new companies and people to area. ... Moving into downtown Warren means businesses can run at operating costs 20-30 percent lower than outside of the zone." From oil to geothermal. All it took was 150 years.